Centuries ago, when beavers were plentiful, natural ponds and wetlands would have been a more common sight in the Ohio River Valley. Carolina parakeets, the only parakeets native to the North American continent, would also have been plentiful. Beavers still exist today but the parakeets became extinct in 1918. Early journals written by those who observed them described their flight as swift and direct, weaving in and out through the trees with remarkable grace and precision. The Fort Ancient people, ancestors of present day Algonquian speaking American Indians, lived in villages within the Ohio Valley. Everyone in the village, young and old, depended on one another to survive. Everyone had a job to do and little girls would have often worked alongside their mothers. 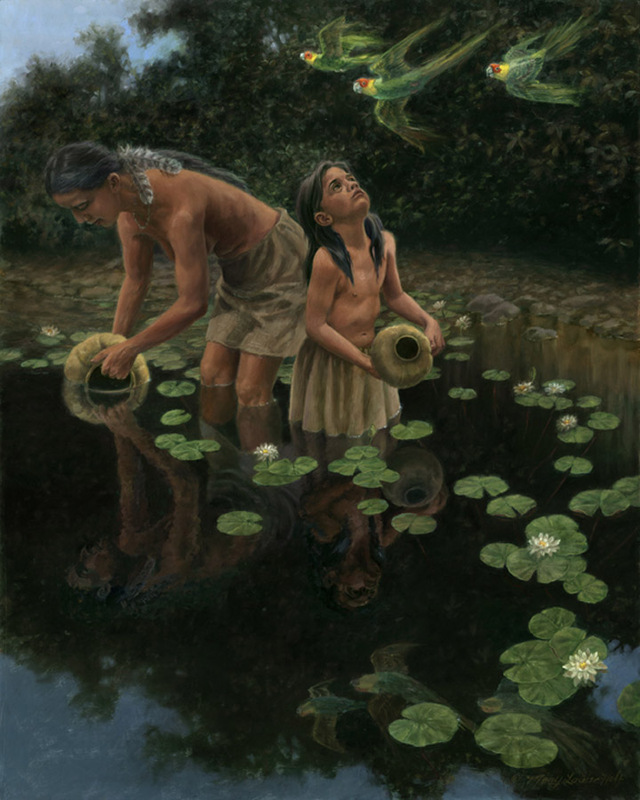 I have depicted a mother and daughter gathering water from a nearby beaver pond. A flock of noisy, gregarious Carolina parakeets fly overhead. Their bright, colorful plumage has caught the eye of the little girl. Creatures of the forest, both avian and earthbound, have gathered together for a brief moment in time.